Even now that Norman Osborn vs Peter Parker image kicks some major tail. It may be one of comics most enduring conflicts (and about to return of sorts this year), but John really makes the duo seem 'real'. Done just prior to the first Rami Spider-Man movie, with its 'warsuit' Green Goblin, this was the image I would use to show the original costume worked fine as is. It can be hard picking just a handful of great images from Watson's portfolio. Not only has he worked on a variety of projects, he is a fellow fan of The Legion of Super-Heroes and every shot is a stunner. With The Invaders vs Red Skull it's details like the heavy duty look of Cap's shield and the inferno coloured skies that prove my point. A backdrop of trees can be hard enough to render, let alone by adding sunlight streaming in through the branches. While nature-loving Poison Ivy reaches up softly, the vines and trees of the piece still add a subtle and creepy atmosphere - one truly fitting of the Arkham inmate. As a fan, John was brought back into comics as an adult by Mark Waid's Terminal Velocity arc on The Flash. That said, it must have been a happy occasion when this commission was requested, starring Wally West's main rival, Professor Zoom. Sure, he's the fictional character semi-responsible for the DC52, but hey, you can't be a rogue without being evil can you? Here John takes yellow - a colour that's difficult to work with at the best of times - and makes it sing, at speeds faster than light. The fluid speed lines rolling of Zoom's body are a trick in themselves, but that frowning face instantly highlight that this speedster may run in light, but he'll always have his feet firmly planted in the shade. What do you think? To see John's full gallery, including the likes of Batman, The Legion and Aquaman, click here, or to visit him on blogger, click here. What stunning pics. hey I cant seem to open these tabs you click on...Id love to see his LSH...any chance they could be posted on here, Dan? Hey Karl - glad you liked John's art! Part of his Legion gallery is a series of cover recreations of famous Superboy and The Legion covers, so there is plenty to make more posts out of that's for sure. Sorry you are having troubles with the link. I have re-checked both and they still work on this end. One goes to www.johnwatsoncomicart.blogspot.co.uk the other goes to www.seven-wonders.co.uk/johnwatsonart/index.html - he's also on comic art community too. Believe me, when you see his art you'll go, oh yeah I have seen his covers! Holy hell! Mr.Watson is da man! 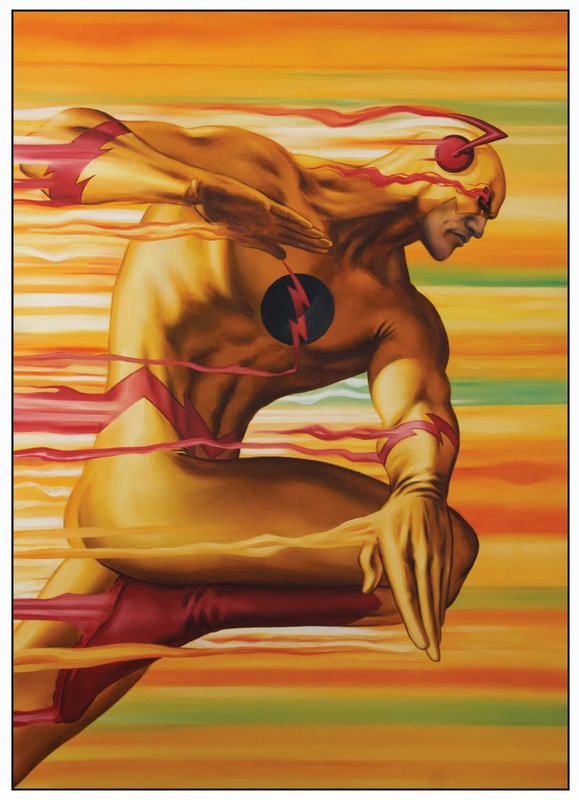 Love the art; it reminds me of early Alex Ross. The Prof. Zoom is probably my favorite though. Great re-do/homage to the Adam Kubert cover I think.